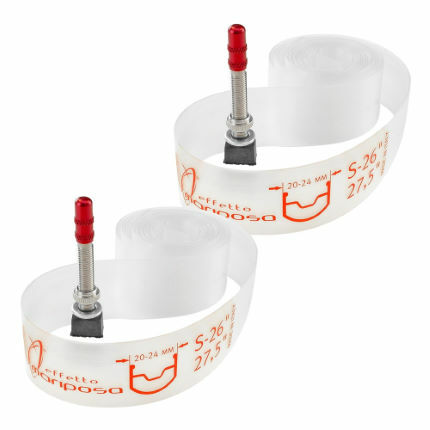 Caffélatex Strip is a very light, puncture-proof and transparent tubeless rim strip that makes tubeless conversions quick and easy. Sold as kits containing two rim strips and two 40 mm tubeless valves (2 wheels per kit). 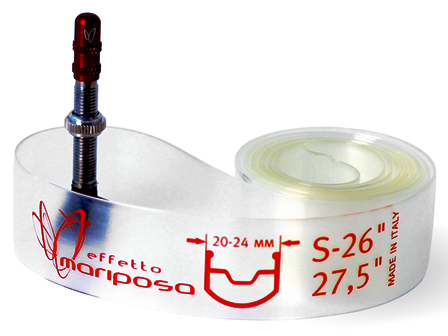 Effetto Mariposa Caffelatex Strip M-26/27.5" (x2). • L (35mm): for rims with external section between 30 and 34 mm. Up to 7 bar (100 psi). Depending on rim width, Caffélatex Strip is easy to use for adventure road cycling and wider road tyres. WARNING: using sealants containing aggressive chemicals or ammonia, or cleaning the rim with aggressive chemical products can damage Caffélatex Strip and may represent dangers to the user. We recommend using only Caffélatex sealant or Espresso inflate & repair cartridge with Caffélatex Strip. *Picture shown is a representation, you will be shipped the size that you order.